U.S. officials are investigating the fatal shootings of three American soldiers at a Jordanian air base earlier this month as a possible act of terrorism. American and Jordanian officials have offered conflicting accounts of what provoked the Nov. 4 shooting. "Investigators are considering all potential motives and reasons for why American service members came under fire and they have not yet ruled out terrorism as a potential motive," the American embassy in Jordan said in a statement Wednesday, the New York Times reported. "Contrary to press reports, there has been absolutely no credible evidence to suggest that U.S. personnel acted contrary to orders or established procedures when accessing the base," the embassy continued. The three servicemen were in Jordan on a training mission working with the Jordanian military. 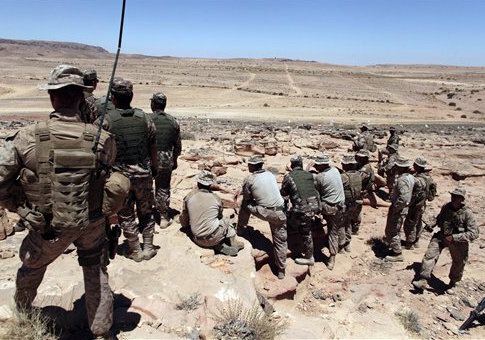 They were returning to the Prince Faisal air base in the city of al-Jafr in southern Jordan when a Jordanian soldier opened fire. Jordanian officials told reporters soon after the shooting that the vehicle carrying the service members failed to stop at the security gates. Two days after the incident, the Pentagon said the service members were killed when their vehicle came under fire as it was entering a Jordanian military base, indicating there was no issue with the vehicles failing to heed orders to stop. The Jordanian soldier who initiated the exchange of fire was wounded in the incident and remains in custody. The incident marked the fourth attack since last November on security services in Jordan. This entry was posted in National Security and tagged Jordan, Military, Terrorism. Bookmark the permalink.